The long wait to get back to racing is finally over for Brad Keselowski and the 2 Crew. The green flag drops on the 2019 Monster Energy NASCAR Cup Series season this Sunday with the Advance Auto Parts Clash at Daytona (3 p.m. ET, FS1), which he’ll start from P3. Brad enters that race as the defending champion, after winning the 75-lap exhibition race last February. But he’s hungry for more at Daytona this year. Speedweeks is already underway, and The Clash is part of a busy weekend for the 2 team. It began with three practice sessions on Saturday. Daytona 500 qualifying commences on Sunday afternoon (12:10 p.m. ET, FOX). That session will set the front row for the 500 and the field for Thursday’s Gander RV Duels at Daytona. But it’s the type of busy that’s more than welcome by Brad, after being away from the track for the majority of the last few months. BK believes he and his team are plenty prepared to get back to work in pursuit of a championship, and a signature win at Daytona. Brad will also be hitting the track this weekend for the first time officially in his new ride, the 2019 Ford Mustang, which takes the place of the Ford Fusion in the Monster Energy NASCAR Cup Series this season. 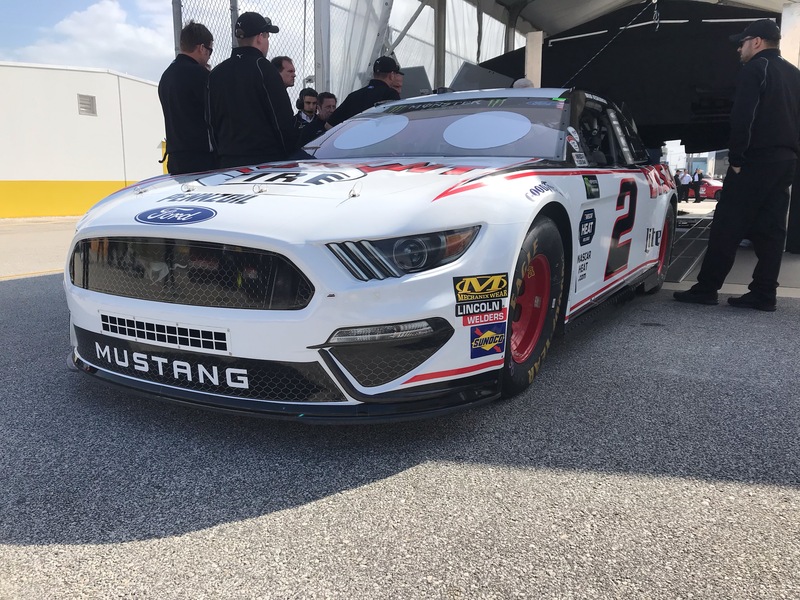 The Mustang has long been Ford’s model in the Xfinity Series, but makes its Cup Series debut this season. Bringing his brand new Mustang to Victory Lane at Daytona would be a great way to welcome one of America’s premier muscle cars to Cup Series competition. Though he’s yet to win The Great American Race, Brad has had plenty of success at Daytona over the course of his career, including that win in the 75-lap exhibition Clash last February. BK also has four top-10 finishes in points races at Daytona, including one of the signature wins of his career, when he captured the checkered flag in the 2016 Coke Zero 400 for Team Penske’s milestone 100th Cup victory. Entering his 10th Daytona 500, Brad has led 38 laps total in The Great American Race and his best finish in the 500 was a third-place run back in 2014. After picking up “bucket list” wins at Darlington and Indianapolis last season, BK is even more hungry to add the Daytona 500 trophy to his trophy case. Starting the weekend with a strong showing in qualifying and The Clash on Sunday would certainly provide a confidence boost for Brad and the 2 Crew ahead of the 500.